FXX’s original comedy series IT’S ALWAYS SUNNY IN PHILADELPHIA is back for a 12th season featuring everyone’s favorite bar owners!The Gang returns to Paddy’s Pub with Mac (Rob McElhenney), Dennis (Glenn Howerton), Charlie (Charlie Day), Dee (Kaitlin Olson) and Frank (Danny DeVito).This season, the gang goes to a waterpark, deals with a Wolf Cola PR nightmare, and actually spends a whole day tending bar!IT’S ALWAYS SUNNY IN PHILADELPHIA was created by Rob McElhenney. He also serves as Executive Producer along with Glenn Howerton, Charlie Day, Michael Rotenberg, Nick Frenkel, Tom Lofaro, Scott Marder and David Hornsby. 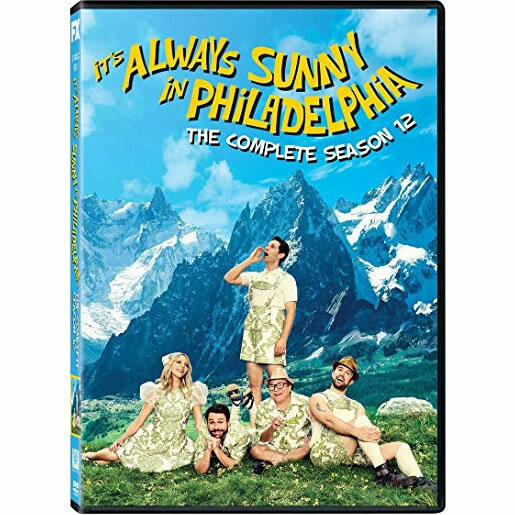 The show is produced by FX Productions.IT’S ALWAYS SUNNY IN PHILADELPHIA is distributed by 20th Century Fox Television Distribution. So, if you’re on season 12 we can skip immediate from ‘what is this’ to ‘is there any way that this show is still vital after all this time’. Me, I’ve been waiting for this show to fall on its face for about 5 seasons and I have yet to be really disappointed, except by an episode here or there. You know what you’re getting here, and it’s just amazing that there’s any of it left. This is the best television sitcom of all-time.